After leaving Parsons, Chris gained further experience at Bolsover Property Services, and then went on to work for Smith and Davy Decorators at Dronfield as a sub-contractor for over 6 years. During this period, he honed his skills and learnt the full spectrum of quality professional painting and decorating from small homes and domestic work, to large business institutions like hospitals, tax offices and the much loved 18th century property at Cannon Hall near Barnsley. Having completed his ground work and gaining substantial experience along they way. 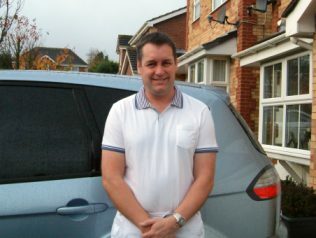 Chris started CG Roberts Decorators in July 1997 working for hundreds of satisfied customers around Chesterfield, North Derbyshire and South Yorkshire. He enjoys working on a friendly one to one basis with his customers and takes he pride in his work and giving total customer satisfaction. This is reflected in the fact that a large percentage of his work is by recommendation and referral as well as a very loyal existing customer base. Chris has several accreditations including four City and Guilds certificates in painting and decorating to advanced craft level, a Construction Industry Training Board skills test certificate in decorating, and two Pride in the Job awards issued by the National House Building Council as shown below.